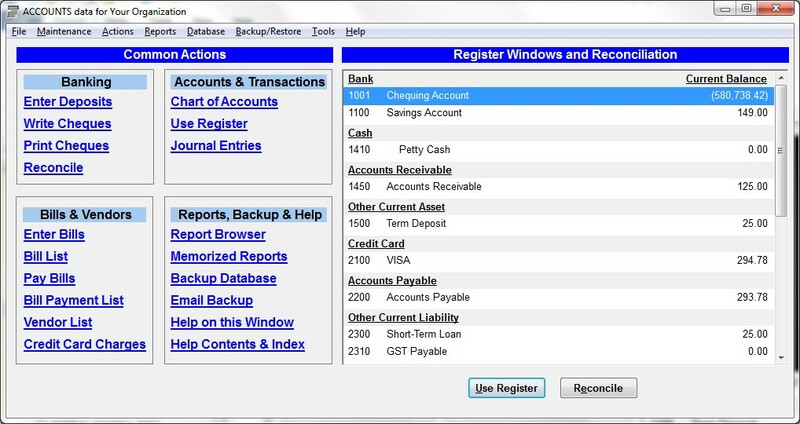 The main window contains the main menu at the top, a number of quick links for common actions (including data entry windows for special purposes) on the left, and also a listing of your balance sheet accounts (Assets, Liabilities, and Funds / Equities) on the right, for which you can use register windows to enter transactions. Most of your work will involve the entry of financial transactions. That will be done either with the special-purpose data entry windows listed in the quick links on the left, or on the register windows for the accounts listed on the right. To open up a register window from this main window, you can double-click on an account, or click on an account and then click the Use Register button. Note: Only accounts with no sub-accounts can have transactions entered for them, and thus only those accounts are displayed in the list. The accounts displayed in the list at the right also display their Current Balance, i.e. their balance as of the current date. That excludes any future-dated transactions. These balances are updated after any action that can change them, such as using a register window or a special-purpose data entry window. All of the quick links options on the left are exactly the same features as the options with the same (or very similar) names on the main menus, mostly the Actions or Maintenance menus. Note: Almost all transactions you need to enter will affect a balance sheet account, and thus can be entered from the special-purpose data entry windows and/or register windows accessed from here. Very unusual transactions that affect only Income or Expense accounts, without affecting a balance sheet account, can be entered as journal entries, via the Actions ⇒ Journal Entries menu option or the Journal Entries quick link on the main window. There is also a right-click menu on the list of accounts in this window. Right-click on an account for options for Use Register and Reconcile. If you realize that you need a new account, add it in with the Maintenance ⇒ Chart of Accounts window, also accessed via the Chart of Accounts quick link. After you have added it, it will appear on the main window (if it is a balance sheet account with no sub-accounts). Most data entry windows on which you have to select accounts also have an "<Add Account>" entry on their drop-down list of accounts, for adding an account during your data entry. You may want to run one or more reports after each day's work to have a printed record of your entries from that day. Enter Deposits Brings up a window for entering deposits to a bank account. The same as the Actions ⇒ Enter Deposits menu option. Write Cheques Brings up a window for writing / recording cheques against a bank account. The same as Actions ⇒ Write Cheques. Print Cheques Brings up a window for printing a range of cheque numbers from a bank account. The same as File ⇒ Print Cheques. Reconcile Just gives a message explaining that to reconcile an account, you select the desired account on the list of accounts on the right side of this window, then click the Reconcile button below the list. Bill List Brings up a window with a list of your bills that you have entered but not yet fully paid off (with another option to also show paid bills), and allows you to do maintenance on them, including deleting or editing bills entered in error. The same as Actions ⇒ Bill List. Pay Bills Brings up a window for paying bills that were previously entered via Enter Bills. The same as Actions ⇒ Pay Bills. Bill Payment List Brings up a window with a list of your previous bill payments, and allows you to do maintenance on them, including deleting or editing bill paymens entered in error. The same as Actions ⇒ Bill Payment List. Vendor List Brings up a maintenance window with your list of vendors. The same as Maintenance ⇒ Vendor List. Credit Card Charges Brings up a window for entering credit card charges. The same as Actions ⇒ Credit Card Charges. Chart of Accounts Brings up the window displaying your entire chart of accounts, and allows you to do maintenance on that list. The same as Maintenance ⇒ Chart of Accounts. Use Register Just gives a message explaining that to use a chequebook-register style register window for an account, you click on the account in the list on the right side of this window, then click the Use Register button below that list. Journal Entries Brings up a window listing your past journal entries, with the ability to do maintenance on them (including entering new journal entries). The same as Actions ⇒ Journal Entries. Report Browser Brings up the report browser window, allowing you to see all of the program's built-in reports, with descriptions, and run them. The same as Reports ⇒ Report Browser. Memorized Reports Brings up the Memorized Reports window, which allows you to re-run reports memorized from the report viewer, Custom Reports, or via the Database ⇒ SQL Select menu option. For the latter two types, it also allows you to further edit their definitions. Backup Database Starts a backup of your current database. (You can also set up regular prompts to do this, and optional Internet backups, with the Backup/Restore ⇒ Backup Frequency and Options menu option.) The same as Backup/Restore ⇒ Backup Database. Email Backup Creates a backup of your database, then allows you to email the backup to any email address. The same as Backup/Restore ⇒ Email Backup. Help on this Window Brings up this help page. Help Contents & Index Brings up the program's help file, pointing to either the Contents tab or the Index tab (whichever one you used last). Very useful for looking up help via keywords.